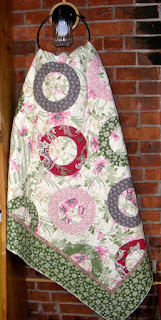 Quilting Adventures: Quilting Recap 2010......! Allow me to share with you a quilt I made in December 2010. I've never been a fan of the use of fusible web for a quilt. I decided it was time I took the opportunity to justify my opinion by making a raw edge applique lap quilt using Stream a Seam lite 2. Make Life go Round by Sweetwater. However, I call this quilt Ruffled Feathers! Although I feel that fusible web has its place in the quilting world, it's not for me. For one thing, it increases the cost of making a quilt. Would you believe I used over 4.5 yards of fusible; that's the cost of a couple of yards of cotton fabric! To my surprise, the circles are soft and pliable. I somehow expected the quilt to be stiff! Not sure it cuts back on the time it take to make the quilt. I still had to stitch around the outer and inner edge of the circles. Another down fall, I had lots of odd size pieces of the fusible web. Sigh! So I made this cute little table topper! 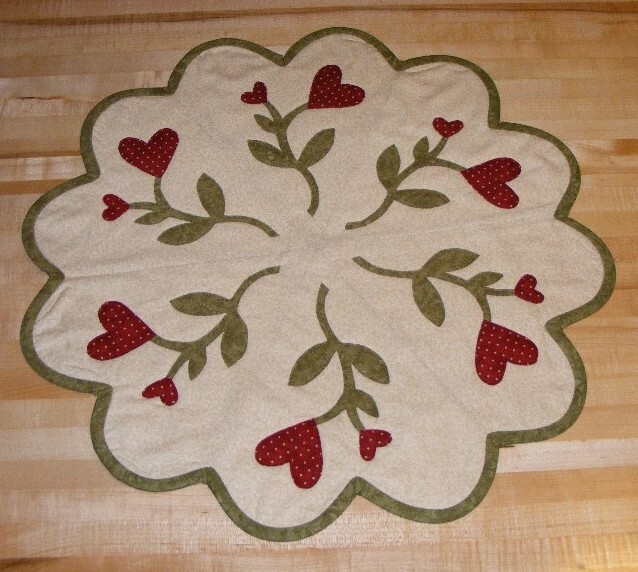 The pattern is from Sweetwater and is called, Heart Table Mat. I did mention in a prior blog entry that I would publish the winner of the quilt kit, so..... First, I want to take the opportunity to again thank all those who partook in the auction to benefit Queensland Flood Relief. You gals are great! Drum roll please ........ The winner of the Civil War Chronicle kit is Donna from Chookyblue blog. Thank you Donna for your generous contribution. Off to work on a quilting project! Thanks for stopping by! Great quilt & tabletopper...I am so thrilled for Chookyblue! I love to read your blog and see all that you are doing. Your projects are beautiful. You truly inspire me. Thank you my friend ! Oooh, Congratulations to Donna! I LOVE Sweetwater and that quilt is so cute! I'm with you though -- def. no fusible/raw-edge for me. I've seen some gorgeous raw-edge quilts that would be almost impossible to do with turned under applique though, so it's tempting. I just don't think it will stand the test of time! Cute hearts too! I've never been a fan of fusibles either, but I can see their use. I love your table topper. It is just darling. Your table mat is just perfect for Valentines!! I am not a big fan of fusibles...except for wool, and in very small pieces. Love your progress!! That is a darling table mat. I, too, am not a fan of fusible web. Ugh. Love that Jo quilt and really LOVE that table topper! That is beautiful! 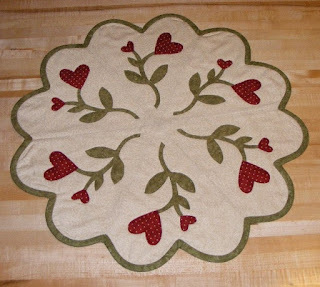 The table mat is great, I love the hearts and how they are representing flowers.